Earlier this week I presented a paper at the St Andrews Divinity School Biblical Studies Research Seminar. The paper was warmly received, several responses have helped me further strength my case and none, as far as I could tell, seriously questioned or undermined my argument. I have posted a (slightly worked up) copy of the paper on my academia.edu site and have created a 30 day feedback session there so folk can view and comment if they would like. Here is a brief summary of the argument. The name is “Lord” (Greek: kyrios). The name is God’s own name; Yhwh or Kyrios in the sense that the Greek word “Kyrios” functioned as a translation of the Hebrew word that Jews used as a substitute for the name of God—adonai. An argument can be made for each of these. A careful reading of the Greek of Phil 2:9–11 in its original first century historical context gives grounds for each of them. Although there is no consensus, the majority (including leading voices in the study of NT Christology such as Larry Hurtado and Richard Bauckham) now vote for option 2. However, there are seriously problems with each of these three. Option 2, for example, surely implies that Paul believed that Jesus somehow became Yhwh–Kyrios at his exaltation. If he was divine already in pre-existence (where he is “in the form of God” in v. 6), at v. 9 he is exalted to a higher position as a result of his receipt of the divine name. (For an example of the way this reading works and its implications for an account of the origins of the earliest beliefs about Jesus, see a recent blog post by Larry Hurtado). In the paper I gave at St Andrews I argue for a different approach to the one that almost all modern scholars currently take. I agree that Christ is identified with the divine name. The citation of language that describes the nations’ prostration to the one God in Isa 45:23 in vv. 10–11—“every knee shall bow … every tongue confess”—makes that clear. But there are numerous reasons to doubt that the name that Jesus receives for the first time in v. 9 is Yhwh-Kyrios. There is no clear parallel to this idea anywhere else in the earliest Christian documents where is, on the contrary, rather widespread and consistent evidence for the belief that Christ was identified with Yhwh-Kyrios already in pre-existence. The name above all names is the three-part name-title “Lord/LORD Jesus Christ”. The name Yhwh-Kyrios is not given to Christ at his exaltation after death. The onoma that is “given” is a multi-part name title that is given in the sense that, for the first time after his death and resurrection, Jesus is publicly known and recognised as—and to be worshipped as—the one who is also Kyrios and Christos. His name-title contains the divine name (Yhwh-Kyrios), but it specifies the divine person for whom the hymn provides a brief biography as the one who has now (at the end of days) uniquely manifested the divine identity: Yhwh-Kyrios-Jesus-Messiah. This understanding of the divine name makes sense of the Greek expression κύριος Ἰησοῦς χριστός (that I have translated “Lord/LORD Jesus Christ”) in the context of both Philippians (cf. 1:2; 3:20; 4:23) and the rest of Paul’s letters. It also makes very good sense given the various ways names and titles functioned in the first century Jewish and Greco-Roman worlds (especially in texts honoring and praising human and divine persons). The three-part name title beautifully sums up the description of Christ in the hymn, where he is portrayed as: (a) a sovereign “Lord,” (b) “Yhwh-Kyrios” made-manifest, (c) the man Jesus of Nazareth (exalted to heaven), and (d) the Messiah who sums up in his life story the identity of all humanity (as a new Adam). The Greek of v. 11 is ambiguous. (There are multiple, deliberate, ambiguities all the way through the hymn). First century readers or hearers of the piece would construe the Greek in several ways, all of which would help to unpack the primary sense that the one who was “in the form of God” in pre-existence is now known and worshipped as “kyrios Iēsous Christos”. because her humiliation has been fulfilled, her sin has been released, because she has received from the Lord’s hand double that of her sins. The Hebrew does not have “O Priests”. Evidently, the Greek translator(s) thought it was important that those whom the prophet summons to announce the good news of forgiveness to Jerusalem were priests. Interesting. Perhaps it is not a coincidence that the NT claims the first verses of Isa 40 were fulfilled by John the Baptist—a priest (Matt 3:3; Mark 1:3; Luke 3:4–6; Matt 3:3, cf. Luke 1:76). Perhaps this Septuagint text (and others like it) ought to guide our interpretation of passages where Jesus of Nazareth announces the forgiveness of sins. Wesley Hill has written an important book about Paul’s theology, developing the work of his doctoral supervisor Professor Francis Watson (of Durham University, UK), on some ways in which trinitarian theology us understand the shape of Paul’s language about God the Father, Jesus Christ and the Spirit: Paul and the Trinity: Persons, Relations, and the Pauline Letters (Eerdmans, 2015). Sadly I came to it after completing volume 1 of Jesus Monotheism, but I am happy to report that its arguments dovetail with my own understanding of Pauline Christology, and in several ways it makes a timely contribution to the study of NT Christology. 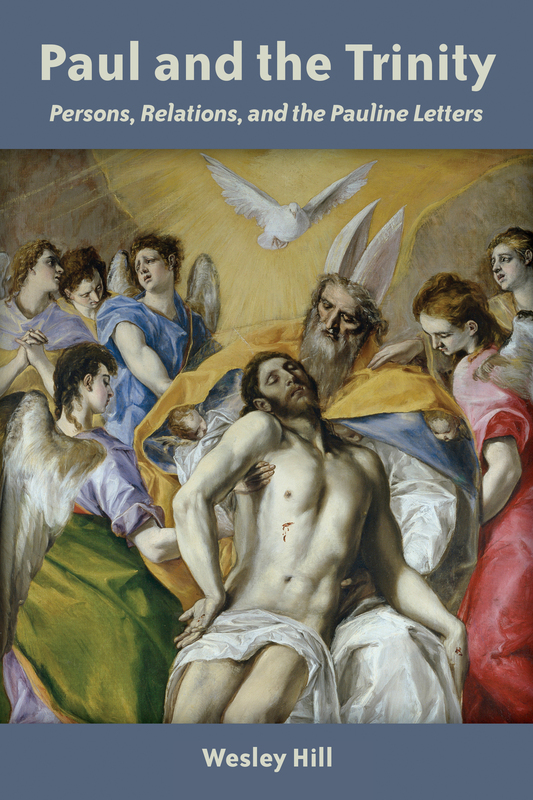 A clear and readable overview of recent approaches to Trinitarian theology that makes technical discussions among systematicians accessible to NT scholars trained in traditional historical and literary methodologies. A compelling discussion of the need to account for all the evidence for the relationship between God the Father and the Lord Jesus Christ through simultaneous descriptions of the ways they are and the ways they are not differentiated from one another—a “redoubled” discourse that does justice to their asymmetrical mutuality. One of the clearest and best exposition of 1 Cor 8:6 that I know of. Some incisive criticisms of the work of leading voices in NT Christology scholarship (Dunn, James McGrath, Hurtado and Bauckham). In arguing for a trinitarian reading of Paul Hill provides an astute analysis of mainstream modern scholarship for whom it has been a badge of honour that the interpretation of Paul is not contaminated by anachronistic patristic categories. Reading Paul’s talk about God, Christ and the Spirit in terms of the relations between persons also produces some invaluable exegetical insights. He does a fine job, for example, critiquing the common view that the last phrase in Phil 2:6–11 (“to the glory of God the Father”) is a rear guard action designed to ensure that there is no suggestion of competition between the one God and the exalted Christ. In one respect, this book will, I hope, change the field forever: Hill calls out and challenges the assumption that it is right to frame discussion of NT Christologies in terms of whether, in a particular passage or at a point on a historical line of development, there is a “low” or “high” Christology (esp. pp. 18–30, 168–9). As he rightly notes, the standard question in twentieth century has been “the degree of Jesus’ divinity” (quoting Raymond Brown). Hill proposes that that the texts should be discussed within a different framework—one that respects the traditional Christian language of divine persons and relations. God the Father, Christ and the Spirit all belong within a web, or skein, of relations, rather than on a vertical axis (p. 169). In this, he makes a cogent case that should help direct the terms of all future discussion NT Christology. I have long had my doubts about the high-low framework and I touched on this issue in Jesus Monotheism, Volume 1 (ch. 3). In the wake of Hill’s book I propose the high-low Christology language should either be abandoned or used with great care and a consciousness of the theological and methodological assumptions that it makes. 1. Hill is right to challenge the dominant historical model that insists we must interpret NT theology solely through the categories of Second Temple Judaism (comparing Christ to angelic or divine mediator figures, for example). However, at times the baby is thrown out with the bathwater and Hill abstracts Paul’s letters from their historical context. And this means his trinitarian reading of Phil 2:6–11 is unlikely to convince because he does deal adequately with the historical objections to it. There are weighty reasons for thinking that in that Passage Paul cites a hymn that ascribes to Chirst the language of the divine ruler and ideal emperor, and that the text’s primary context is an early Christian political theology rather than a later trinitarian one. For several specialists, Samuel Vollenweider1 and Adela Yarbro Collins2 among them, that context means the hymn cannot be anachronistically interpreted through fourth century categories. It is surprising that Hill does not engage this political reading of the passage. A robust engagement with Paul’s historical context should not be feared. Hill argues it is a mistake to read the last phrase of Phil 2:11c—“to the glory of God the Father”—and hear a concession to Jewish monotheism that ensures Christ and God the Father are not in competition with each other. I agree with him on this point. (There is no reason to think that among the earliest Christians anyone would think that the rest of Phil 2:6–11 would suggest competition between God (the Father) and the Lord Jesus Christ. That explanation of v. 11c tells us far more about modern notions of Jewish and early Christian theology than it actually reflects first century views or debates). But I am surprised that Hill does not comment on the Philippians context of the hymn. That might help his case. Is it a coincidence that Paul is bothered by a competitive culture of honour and glory in Roman Philippi (on which see Joseph Hellerman, Reconstructing Honor in Roman Philippi: Carmen Christi as Cursus Podorum, 2005), and that the hymn supports his call for a unity of relations among his readers (Phil 1:27–2:4, cf. 4:2)? In the surrounding literary context “glory” and “vainglory” (i.e. competition for honour and glory) are concerns at the forefront of Paul’s argument (1:11; 2:4; 3:18–21; cf. 4:1). In this context, I suggest, the hymn presents a harmonious relationship between divine persons as a model or warrant for harmonious relations between human persons. The usual scholarly view (that Hill rejects) concedes the point to those who fear a competition for honour and glory between God the Father and the exalted Christ. That usual view, in effect, implicitly endorses the (cultural and philosophical) assumptions in pagan Philippi: persons, including divine ones, compete for honour and glory. 2. A danger in reading Paul through the lens of later Trinitarian theology is the likelihood that the particularities of individual texts will be ignored. This, I think, has happened in one detail of Hill’s exegesis of Phil 2:6–11. He says our interpretation should recognise the asymmetrical relationship between the divine persons in that God sends Jesus (p. 81, 109). But he doesn’t, does he. And that is one of the ways Phil 2:6–11 is such a remarkable passage: the one “being in the form of God” comes from pre-existence of his own volition (v. 7) and in light of his discerning correctly on the issue of equality with God (v. 6b–c). He is not sent. He is his own person, even in pre-existence. Hill seems to have collapsed Phil 2:6–7 into other incarnational statements in Paul’s letters (e.g. Rom 8:3; Gal 4:4). 3. I agree with N. T. Wright’s (appreciative and constructive) critique of Hill’s book when Wright complains that Hill has ignored all the ways in which the biblical story and theology (especially Adam as God’s image, the Temple, and the Exodus story) provided raw materials and categories for Paul’s presentation of the relationship between God and Christ. What we need now, in the light of the work of both Wright, Hill and others, is a creative conversation between a robustly historical approach to Paul’s (implicitly) trinitarian theology and the later (patristic) construal of that theology in terms of persons and relations. Such a conversation would no doubt mean that the early interpreters of Paul will sometimes illuminate his writings. But it will also lead us to conclude, I am sure, that, in some ways, the apostle was closer to the inner meaning and full ramifications of the Christ event and its biblical context than were those who established a trinitarian orthodoxy in the fourth century and beyond. In the end, the question is not who best helps us understand a (Pauline or some other) text (exegesis), but who, or what, most faithfully represents and interprets the life death and resurrection of Jesus (history). 1. S. Vollenweider, “Der ‘Raub’ der Gottgleichheit: Ein religionsgeschichtlicher Vorschlag zu Phil 2.6(-11).” New Testament Studies 45 (1999): 413–33. 2. A. Y. Collins in A. Y. Collins and J. J. Collins, King and Messiah as Son of God: Divine, Human, and Angelic Messianic Figures in Biblical and Related Literature (Grand Rapids: Eerdmans, 2008), pp. 113–116, 208–9. I am grateful for a couple of blog posts dedicated to Jesus Monotheism 1 that have appeared in recent weeks. One by Derek Rishmawy is entirely fair and appreciative. The other, at The Two Cities site, is by Max Botner at St Andrews. It is also appreciative, though a little more probing. He makes some valuable observations on my approach to Christological origins and I’d like to comment on a couple of points he makes. It is true that I am going to argue for the importance of priestly precedents for the earliest Christology. And, to be fair to any readers who might have gained the impression that I think “priestly” messianism “rather than” royal messianism is the key, in my discussion of Ruler Cult (in JM 1 ch. 6) I do argue that priestly categories have been neglected and there has been an over-emphasis on kingship in much of the scholarship. At least, scholars who come at the pre-Christian Jewish material looking for answers to NT questions have missed the considerable evidence (highlighted by a long line of non-NT specialists) that the high priesthood and priestly messianism was rather important to Second Temple Jews. But I do not see a sharp “rather than” between priesthood and kingship as precedents for NT Christology. Biblical prophecies, and first century Jewish expectations, of a coming king are very important for Christological origins. (This is why Joshua Jipp’s new book Christ is King is so important). Also, for many, if not most, Jews the high priest was a royal figure. For some he was, indeed, a king. So Israel’s high priesthood necessarily means “and also” not “rather than” royal messianism. Against this background, I will argue in volume 4, the fact that Jesus is both a high priest and a messianic ruler in the line of David means the peculiar character of his kingship stands in sharp relief. Paying attention to the role that the high priesthood paid in the Bible and in Jesus’ historical context means Jesus’ royal self-consciousness was far more important than mainstream NT scholarship has hitherto realised. … Fletcher-Louis’s decision to build his argument from the “emerging consensus” has its strengths and weaknesses. Its strength is that it allows him to focus on issues within early high christology models which have hitherto gone unaddressed. Its weakness is that the project hinges, in part, on whether or not one comes to the book already persuaded by the “emerging consensus.” For readers who are persuaded, such as this reviewer, this move is of little consequence; for others, however, I suspect that the book’s minimal engagement with scholars who do not align with this “consensus” may be deemed problematic. I am a little surprised by this comment. It is true that volume 1 does not have a chapter titled “scholarship outside the emerging consensus”. But every chapter bar the first one engages with questions and issues that have led some specialists to reject the findings of the emerging consensus. And on several key points (esp. chs 3–7) I have voiced my agreement with those who have raised objections to the approach adopted by Hurtado and Bauckham. (I agree with Dunn and Casey that a lack of persecution of christians for Christ devotion is a problem that Hurtado and Bauckham have not adequately addressed. I agree with leading voices of the Enoch Seminar that the Similitudes of Enoch and a Jewish Son of Man expectation must have played a more important role in Christological origins than the likes of Hurtado and Bauckham admit. And so on … more of this in volume 2). I wonder, if there is some truth to Botner’s comment, is it simply because there really has not been much critical reaction to the “consensus” that I discern gathering around the work of Hurtado and Bauckham. Have I missed any critical publications of their work? There is perhaps a problem here which I did not describe explicitly in JM 1. There are, no doubt, scholars who remain committed to an older paradigm who reject some/all of the emerging consensus findings. But they have not explained (in print) why they remain committed to older views. One hope I have had in writing Jesus Monotheism is that it will provoke a deeper and wider conversation. If there are weighty arguments against those points of the emerging consensus that I have endorsed and that I have missed I would love to hear them. In my last post I offered a few thoughts on Joshua Jipp’s new book Christ is King. I’ve enjoyed reading Joshua’s work ever since I came across his insightful and well written book on divine visitations and hospitality to strangers in Luke-Acts. (I have particularly benefited from his article on Paul’s Areopagus speech in Acts 17—published in the Journal of Biblical Literature vol. 131 2012—which anticipates my own reading of that passage that I will lay out in another volume of Jesus Monotheism). My blog post focused on Joshua’s argument in the third chapter of Christ is King that biblical and Greco-Roman kingship traditions are the most important “historico-religious framework” for the origins of the belief in Jesus’ divinity. Joshua himself commented on my post. And I’m glad to see that Joel Willits, who is an expert on the relationship between the royal messiah and early Christology, has now weighed into the debate with his own blog post over at Evangelion in which he both reviews Joshua’s third chapter and adds some comments on my comments. This blogsphere interaction highlights two important questions that, to my mind, are pressing for current discussion of Pauline and early Christology. 1. 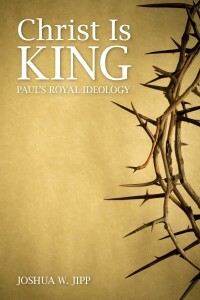 If kingship is so important for Pauline Christology, then why does Paul never use the word “king” for the risen Christ? Why is Greek kingship and Emperor language (sōtēr, euergetēs, for example) either rare or unattested in Paul. (This is a question which also, I think, needs to be put to N. T. Wright’s account of Pauline Christology and its origins. 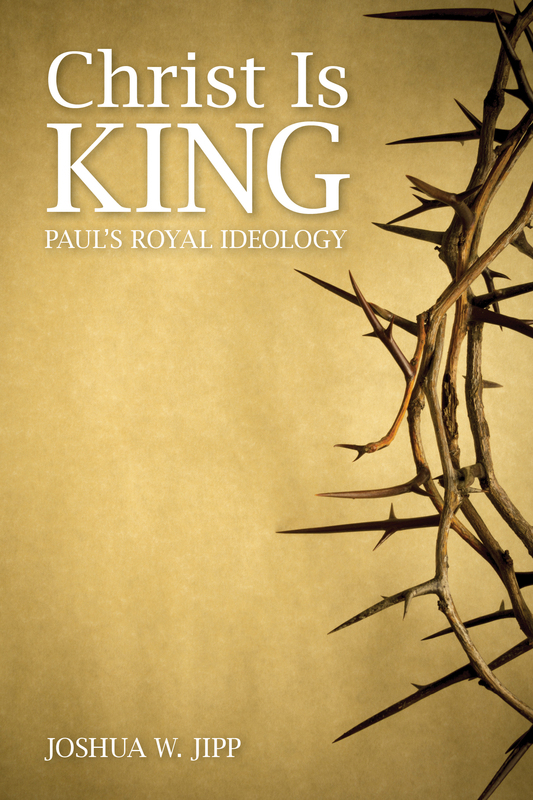 Wright also places considerable weight on royal messiah as the meaning and historical background of Paul’s Christ language. Perhaps Tom has an answer to that question somewhere. If so, I’ve not seen it). Why, to repeat a point I made in my last post, does Paul steer well clear of the classic Old Testament kingship and royal messiah texts (Isa 9, 11; Pss 2; 72; 45; 89; Gen 49:8–12; Num 24:17; Zech 6:12)? If you take an hour or so to read all the relevant contemporary Jewish messianic texts (in the Dead Sea Scrolls, in the pseudepigrapha and related material) and then read Paul, you find a startling difference: the classic royal and Davidic Scriptures that crop up again and again in the Jewish material are missing from the apostle’s letters. Why is this? I might have added two points that explain and back up Bauckham’s view. The feminine singular pronoun “autēn” in the last clause (“God has glorified her”) shows that the “glory of it” earlier in the verse must be “the glory of Jerusalem,” not the messiah’s glory. (The Greek Ierousalēm, mentioned in the previous verse, is a feminine noun). The whole of verse 31 evokes the language and themes of the closing chapters of Isaiah (esp. Isa 60:3-4, 9, 19; 61:3, 62:2; 66:20) where it is Zion and all the people of God that become the location of God’s glory and that the nations come to see. The meaning of this passage seems pretty clear to me. But perhaps I have missed something. And if there are any texts from the time of the writing of the New Testament that closely associate Israel’s king with God’s own glory I would love to know. (The difference between divine glory for the high priest and no-divine glory for the king is a small, but important, part of the model of Christological origins that I will offer in Jesus Monotheism, vols. 3 & 4). What do you think, guys?! David Litwa has written an important book on the relationship between Greco-Roman traditions and Christological material in early Christian texts (in the New Testament and beyond). 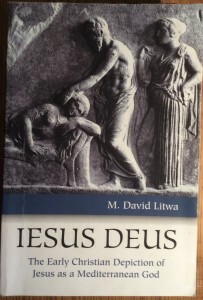 M. D. Litwa, Iesus Deus: The Early Christian Depiction of Jesus as a Mediterranean God (Minneapolis: Fortress Press, 2014). It is a thoroughly enjoyable, informative and stimulating read, with fresh ideas that should be of interest to anyone studying the earliest beliefs about Jesus. In essence, Litwa argues that “early Christians imagined and depicted Jesus with some of the basic traits common to other Mediterranean divinities and deified men.” (215). Larry Hurtado has just reviewed the book on his blog. He is appreciative of some of Litwa’s proposals, but also strongly critical of “errors” that he thinks Litwa has made. In particular, the review makes a forceful response to Litwa’s lengthy critique of Hurtado’s work that Litwa thinks exemplifies an unhelpful and theologically motivated attempt to insulate Christological origins from pagan, Greco-Roman influence. In my own recent work on Christology I have become convinced (in a way that I was not when I wrote my doctoral dissertation) that interaction with Greco-Roman traditions was an important factor in the formulation of the earliest beliefs about Jesus. I agree with Litwa that there has not been as much discussion of this possibility in some circles as there should. And I am not sure that Hurtado has fully heard or understood the nature of Litwa’s criticisms. In particular, Litwa makes some persuasive comments on Hurtado’s negative views of the possibility that a biblical and Jewish monotheism could accommodate some notion of “deification”. (I also touch on this issue in an excursus at the end of Jesus Monotheism Volume 1. And in volumes 2, 3 and 4 of Jesus Monotheism I will set out some fresh proposals for the role of Greco-Roman traditions at the origins of the belief in Jesus’ divinity). On the other hand, Hurtado is right, I think, to press Litwa on the matter of research objectives. Hurtado points out that his own work has been concerned to explain “the historical origins of the phenomena of Jesus-devotion”. Litwa seems more concerned with the literary features of early Christian texts. On my reading of Iesus Deus, Litwa moves tentatively towards the historical origins question in his final chapter (on the gift of the name above all names in Phil 2:9). Litwa comes in that chapter to the conclusion that the idea that Jesus is given the divine name of Israel’s God after his death “was adapted from the imperial conventions of the larger (Mediterranean) culture contemporary with the author of the hymn” (in Phil 2:6–11). This surely raises important historical questions. If the gift of the divine name Yhwh-Kyrios to the exalted Christ in Phil 2:9 is an idea adapted from the non-Jewish world, then when, in the development of early Christian life and thought, was that idea promulgated? And by whom? And for what reason? Does Phil 2:9 exemplify a transition from a Christology in which Jesus is extraordinary, but not divine, to one in which he is “deified” and deemed worthy of worship? Or does the Philippians hymn simply express a much older identification of Jesus with Yhwh-Kyrios (that was originally formulated without reference to Greco-Roman traditions) in a way that would resonate in a Roman city like Philippi? Litwa’s book is perhaps one of the most persuasive—certainly the most recent—to argue for the presence of Greco-Roman motifs in early Christological texts. As the case steadily mounts for the presence of those motifs in early Christian documents, surely now there is a need to explore the historical questions those motifs raise. Above all, what role did they play, if any, in the origins of Christ devotion and the belief that (as R. Bauckham has put it) Christ is included in the identity of the one God revealed in Israel’s Scriptures? In the second chapter of Jesus Monotheism, Volume 1 I focus on the significance of 1 Cor 8:6 for the argument that “Christological monotheism” is a basic feature of Paul’s theology. There has been a dispute in recent scholarship over the interpretation of the Shema in 1 Cor 8:4–6. N. T. Wright famously argued (in his 1991 Climax of the Covenant) that Paul splits open the Shema to include the Lord Jesus Christ in a new reformulated statement of biblical monotheism. Some, for example, James McGrath and James Dunn have argued that Paul does not split open the Shema, rather Jesus is added to it. Jesus is a messianic Lord, not the LORD. He is not included within the divine identity. I argue that on this one Wright is surely right (though McGrath has raised important questions which do need to be answered). In the book, I perhaps should have given more attention to a more basic question raised by 1 Cor 8:4–6. Is there, in fact, any allusion or reference to the shema at all? It is surprising to find still today that one or two seem to think not. Whether we follow Wright or McGrath on this, both agree that Christ is brought into some kind of close relation to the one God and to the daily Jewish prayer that confesses belief in one God. This matters. No discussion of Pauline Christology can now avoid taking a view on 1 Cor 8:6. A highlight of the 2015 (September) British New Testament Conference was a paper given by Dr Andy Byers. Byers made an argument that I wish I had included in my own discussion of 1 Cor 8:6. And he made it convincingly and succinctly. Byers discussed the passages in 1 Cor 8–12 where Paul reminds his readers that there is “one” bread, “one” body (of Christ) (1 Cor 10:17; 12:12–27), and “one” Spirit (12:9–13). It has often been claimed that Paul’s oneness language in these passages comes from a Greco-Roman concordia discourse where the ideal society is harmonious and united. Byers argues that Jewish theological categories provide the primary source for Paul’s oneness train of thought and that these verses in chapter 10 and 12 flow out of the reference to the Shema in 1 Cor 8:6. Let there be one holy city in that place … and let there be one temple therein, and one altar of stones, … In no other city let there be either altar or temple; for God is One and the Hebrew race is one (theos gar heis kai to Hebraiōn genos hen). (Jewish Antiquities 4:200–201, cf. Against Apion 2:193; Philo On Virtue 7:35; 1QS 1:1–14; 2 Baruch 48:22–24; 85:14 etc …). Byers’ had barely 25 minutes to explore the implications of this feature of Paul’s train of thought and I sensed that he was straining to get to points that he did not have time for. Certainly, his paper raises many interesting questions and fruitful possibilities. The way the oneness language is extended to the Spirit perhaps implies a trinitarian redefinition of monotheism for Paul (cf. 1 Cor 12:1–3 where Paul talks about the “the same Spirit … the same Lord … the same God.”) In particular, for Byers, it raises the possibility that in speaking of “one” body as reflective of the identity of the “one” God the community in Christ “are collective representatives of (and perhaps divinized participants in) the oneness of Israel’s God”. A high view of the Church and its connection to the one God is certainly in view, though, of course, the “one body” is not actually included in the identity of the one God, even though it serves as a representative of Him. There is probably more evidence of the importance of the Shema for Paul’s train of thought in these chapters than Byers recognised. It has sometimes been pointed out that Paul’s concern for an undivided heart at the end of 1 Cor 7 reflects a contemporary Jewish view that total devotion to God described in the Shema creates an undivided, perfect heart (see, for example, Brian Rosner, Paul, Scripture and Ethics: A Study of 1 Corinthians 5–7, 164–5). In any case, Byers study is, surely, the final nail in the coffin for the view that there is no evocation of the Shema in 1 Cor 8:6 and that Paul is not interested in the implications of the Christ event for the meaning of Deut 6:4. One way or another, we now have to take a view on what happens to the Shema that verse. In the second chapter of Jesus Monotheism, Volume 1 I present some new evidence for thinking that Paul places the Lord Jesus Christ inside of a redefined, split-open, first line of the Shema (“Hear, O Israel, the LORD your God the LORD is one”—Deut 6:4). Now the one God is a two-in-one God. He is both the one God the Father and the one Lord Jesus Christ. Over the last 20 years much of my research has been on the Old Testament/Hebrew Bible. One aspect of recent advances in Hebrew Bible scholarship has intrigued me, ever since I first came across it in reading Jon D. Levenson’s, Creation and the Persistence Evil. Sometimes there are clear numerical structures in the Hebrew text that reinforce or deepen the plain meaning of the text. For example, Genesis 1 has numerical patterns that help to make the point that the living God has created a world of order, structure and beauty. The text is a kind of icon: its numerical structures embellish or reflect the truths of which it speaks. One day while relaxing in the bath in 2013, musing on Paul’s confession in 1 Cor 8:6, and remembering that in a footnote in his classic article on the verse (in his Climax of the Covenant) N. T. Wright had noted its numerical structure, it dawned on me that that structure might have profound theological significance. The verse comprises 26 words in two equal halves—the first acknowledging the “one God the Father” and the second the “one Lord Jesus Christ—each of 13 words. The numerical value of the Hebrew name of God (Yahweh) is 26 and the Hebrew word “one” has a numerical value 13 (half of 26). As I explain in the book, this cannot be a coincidence. It can only mean one thing: all parts of the confession refer to entities (or persons) who together comprise (or reveal) the one God, Yhwh. And the fact that, although the confession is formulated in Greek, it assumes a numerical structure that comes from the Hebrew language surely also measn that this distinctive reworking of Deut 6:4 was formulated, very early on, in a bilingual (Hebrew and Greek) speaking context. In all probability, it was formulated in Jerusalem in the first years or months after Jesus’ death. My numerical criticism of the confession in 1 Cor 8:6 is my favourite part of the book. The text’s numerical structure weaves a beautiful, almost magical, meaning. The implications are far reaching and remarkable. And I will never forget the moment it dawned on me. As things stand, the rest of the argument of Jesus Monotheism (in the remaining three volumes) depends in part on the implications of this piece of numerical criticism. Perhaps I have missed something in my analysis. If so, I hope that somebody will do me the kindness of pointing out the problem sooner rather than later. In the first chapter of my Jesus Monotheism Volume 1 I describe the most important features of the emerging consensus view that very early in the history of the Christian movement the risen and exalted Jesus was accorded a divine identity. I could not possibly have started Jesus Monotheism with this chapter if I had written a similar book fifteen or more years ago. The field has changed dramatically in the last two decades. When I wrote my doctoral dissertation (completed in 1996 + published a year later as Luke-Acts: Angels, Christology and Soteriology*) the study of Christology was dominated by approaches, positions and characters that are less important now. The most influential book back then was James Dunn’s Christology in the Making (1st edition: 1980). But when I set about the detailed research for the writing of Jesus Monotheism (in 2012) it quickly became clear to me that the work of Larry Hurtado (especially his landmark Lord Jesus Christ) and Richard Bauckham (with his shorter but equally influential Jesus and the God of Israel (and a number of others who have worked under their sphere of influence) has now changed the field dramatically. A divine Christology resulted from external forces and factors, especially the early church’s exposure to Greco-Roman religion. A divine Christology appears from within a still young Jewish movement (based in Jerusalem and Palestine). NT texts place Jesus Christ somewhere on a ladder of being: not quite fully “God,” but “transcendent,” “god-like,” “divine”—and subordinate to the one God. → Debates about how high a text’s Christology might be. A clear distinction between God and the world, with plenty of evidence that Jesus Christ was viewed as divine in the full sense. → Debates how exactly Jesus is identified with the one God of Israel. A lengthy process of development from a low to a high view of Jesus Christ. Not much evidence of development. Strong signs of a sudden appearance of a widely held view of Jesus Christ as a divine figure. Focus on texts, ideas and beliefs. Focus on texts, ideas and how practices (especially worship of Jesus) are evidence of Christian belief. Texts (esp. the Gospels) analyzed to discover layers of Christological development. Less confidence that we can reconstruct layers of tradition beneath the texts. Increased focus instead on patterns, themes, the cumulative evidence of discrete bodies of texts (e.g. the Gospels and Paul). In all these ways the academic debate has, to my mind, progressed in the right direction and I am grateful for all the work that others have done that has made my task a little easier. * Although I stand by some of the arguments in that book (that is narrowly focused on texts in Luke-Acts), it does not represent my current thinking on most of the big questions of NT Christology.